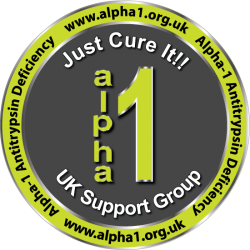 The Alpha-1 UK Support Group is a not for profit organisation and registered charity founded in 1997 by those diagnosed with the genetic condition Alpha-1 Antitrypsin Deficiency who are dedicated to help, advise and support fellow sufferers, their families, carers and friends. Supporting initiatives aimed at development, introduction and widespread adoption of novel therapies for AATD, including research. Working collaboratively with our members and relevant external individuals, groups of individuals, organisations and institutions in order to achieve 1 – 4.